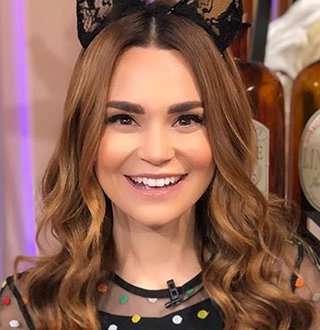 Home » Celebs » Rosanna Pansino Age 33 Boyfriend Now, Baking Plans To Make Husband? American YouTuber Rosanna Pansino has been helping create a world full of sweetness. It's not just by baking desserts, but by showing the world how to forge a sweet bond between sisters. Moreover, a case of dating gone right Rosanna and her boyfriend have been giving aspiring couples relationship goals to strive for through their overly sweet relationship. The Seatle native is a woman with multiple facest-- YouTuber, actress, baker, entrepreneur, and author. She is best known for her self-titled YouTube channel which has more than 10 million subscribers and produces content related to baking, DIYs and hilarious challenges. The talented lady has also tried her hands in music making a music video for single Perfect Together and is the author New York Times best-selling book The Nerdy Nummies Cookbook (2015). She was listed as the highest paid YouTuber in 2016 and food influencer of the year by Forbes. Rosanna Jeanne Reardon was born on June 8, 1984, at Seattle, USA. She grew up with her parents and sister Molly in Washington D.C. Her schooling was done in West Seattle High School and later she pursued her college degree from Pacific Lutheran University. After graduating from college, she moved to L.A hoping to make it big in the entertainment industry. She had always aspired to become an actress but there were far better things baking around for her. YouTube was never her dream but it soon became a fortunate reality in her life. Stepping into the industry for the first time she was very camera shy and in order to increase her comfort level in front of the camera, she started her YouTube channel with a video of baking a Super Mario Star cake. Since then her YouTube career has continued to climb the ladders of sweet success. Aided by her accent, bright smile, darling personality and gorgeous body with a height of 4 feet and 10 inches she slowly rose to fame through Youtube. It's not just her tone and smile that helped her carve a career out of Youtube, as she was ably supported by her family members. Pansino has always had a special bond with her family and that bond has taken her places. Her special bond with her family continued to bloom even after moving to the land of Hollywood and gaining fame. Her parents, sister, and brother-in-law are all her coworkers and part of the company that creates her videos. Among all her family members the one with whom she is very close with is her younger sister Molly, who works in finance at aerospace industry. Rosanna is not only comfortable with her sister off camera but on camera as well and the special bond that the two sisters have is very well reflected on their videos together. Her sister Molly has appeared in several of Pansino's videos which have also garnered millions of views. The most recent and popular video she had with her sister was ONE OF US IS PREGNANT!!! - Sister Q&A video in which it was revealed that her sister was pregnant. The excitement and joy in Pansino's face for her sister's incoming new bundle of joy was clear for all to see. Throughout the video, the sisters demonstrated their love for the other and the closeness they share. Rosanna and Molly are real-life Anna and Elsa giving us major sister goals! Rosanna not only gives us real sister goals but couple goals as well! Anyone would love to date the sweet, bubbly, and beautiful Rosanna and devour her sweet delicacies every day right by her side right? And to all the curious fans there is that someone who gets to devour her baked goods right by her side--her boyfriend Mike Lamond. Her beau is an E-sports commentator and also the creator of the YouTube channel HuskyStarCraft and The Game Station. Pansino and Mike started dating in 2012 and since then they’ve been going strong with every passing day. Both of them share their love for each other openly on their social media platforms giving the world with serious relationship goals. When Is Rosanna Pansino Getting Married? Having been dating for years it is of no surprise that Rosanna's fans are all curious about when the baking beauty is getting married. Rosanna makes us believe that in order to share the bond of love with someone forever there is no rush of marriage at all. But looking at how cute their relationship is we sure as hell would love to see Mike Lamond as the baking queen’s husband-to-be! Vanessa Nadal Age 36 Bio: Who Is Wife Of Lin Manuel Miranda? "Gay Dad" Clay Aiken Raising Son, Where's He Now & Who Is Boyfriend?